Do you wish that your drawing room wall is full of beautiful memories of you and your loved ones drawn by a legend, who got Life Time Achievement Award (Cartoon Watch) from hands of former president Dr. A.P.J. Abdul Kalam? Why not get your unique portrait drawn by hand instead of those regular run of the mill photographs. Now is your chance to get your portraits painted from an Artist who has worked nonstop since 1976 drawing cartoons and portraits. He started his artworks of film parodies published in Filmfare in 1976. With his portfolio of work like Shaktimaan and Kalamdas and ever popular Bablu and movie artists. 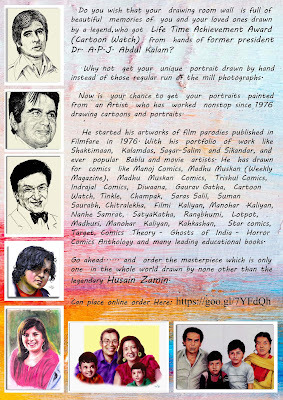 He has drawn for comics like Manoj Comics, Madhu Muskan (Weekly Magazine), Madhu Muskan Comics, Trishul Comics, Indrajal Comics, Diwaana, Gaurav Gatha, Cartoon Watch, Tinkle, Champak, Saras Salil, Suman Saurabh, Chitralekha, Filmi Kaliyan, Manohar Kaliyan, Nanhe Samrat, SatyaKatha, Rangbhumi, Lotpot, Madhuri, Manohar Kaliyan, Kahkashan, Star comics, Target, Comics Theory - Ghosts of India - Horror Comics Anthology and many leading educational books. 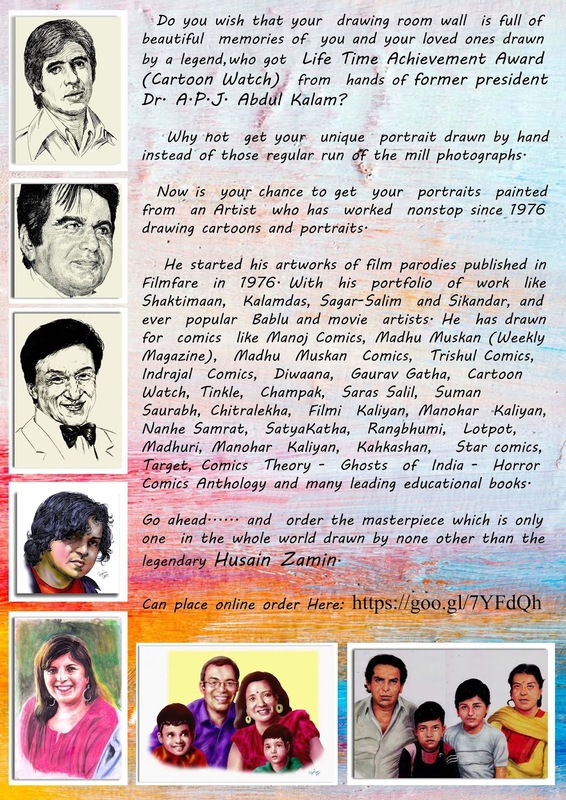 Go ahead.... and order the masterpiece which is only one in the whole world drawn by none other than the legendary Husain Zamin. 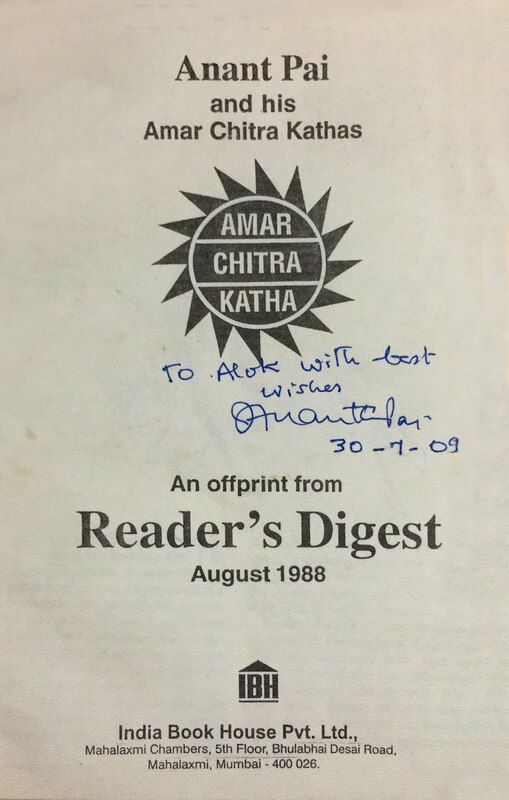 Amar Chitra Katha creator UNCLE PAI(Anant Pai) dead at 81. 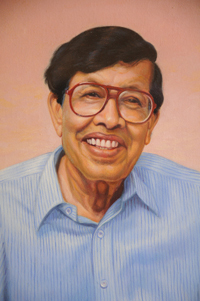 Anant Pai, better known as Uncle Pai, creator of Amar Chitra Katha and Tinkle comics has died at the age of 81. 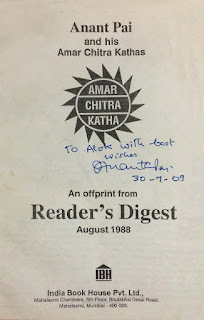 Amar Chitra Katha has shown millions of Indians the route to their roots. Tinkle has been the childhood companion of many for over two and half decades. In 1967, the educational comics series Amar Chitra Katha was launched. 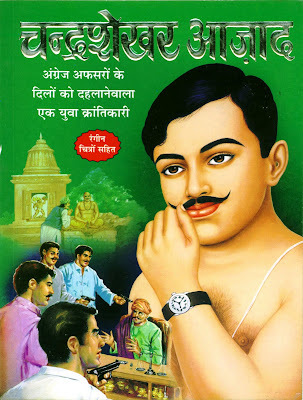 Each of the comics in this series was devoted to a person or event in Indian history, religion and mythology. Anant Pai conceptualized of all of these, and wrote the scenarios for most of them. Hello friends, I'm back. From now, sometimes the posts might contain download link(s), however NOT ALWAYS. The primary goal of this blog was/is informative materials only. Hoping you'll understand and support as earlier. Lets salute the Nation ..our Inependence Day!